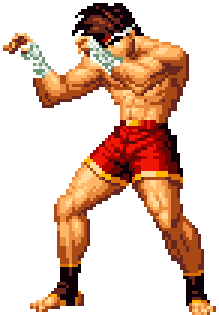 Joe Higashi (ジョー・ヒガシ) is a champion of Muay Thai and a good friend to Andy Bogard. Although Joe's place of origin is Japan, he spent the majority of his time at Thailand, where he trained Muay Thai. It was through his victories that Joe got the nickname "Hurricane Upper" Joe Higashi. Joe is a mainstay to Terry Bogard's Fatal Fury team throughout a lot of the King of Fighters tournaments. During the KoF '94 tournament, Andy Bogard chose to include Joe as a team member instead of Mai Shiranui, making her feel left out. While Joe never played much of a major role since the defeat of Geese Howard in the Fatal Fury series, Joe has proven to be a loyal sidekick to the Bogards, teaming with them in every KOF. He has since become the practical joker amongst the brothers Bogard and their other friends and allies. Joe eventually becomes stronger than his former training partner and best friend Andy Bogard. This page was last edited on 21 September 2012, at 12:51.